The Roman origins of the “June bride” isn’t as romantic as it sounds, but in modern times we have infused meaning and magic into the idea. June, prime wedding time, is just around the corner. 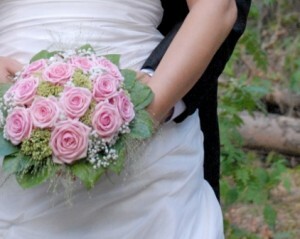 History says that the tradition of June weddings came from ancient Roman culture. Juno, Jupiter’s wife and the goddess of marriage, was officially celebrated on June 1, so many families chose this month to plan weddings. Luckily, today in the U.S. June is filled with the flowers and scents of summer. It’s the time of year when Nature blossoms green, young and full of life. Some of our other wedding traditions hark from ancient Roman times, as well. For example, these were also the days when grooms began carrying the bride over the threshold to protect her from “evil spirits.” Furthermore, grooms began standing on the right hand side of the bride so he could easily access his sword in case marauding rivals came to steal the bride. And, um, fathers “escorted” their daughters down the aisle because the patriarchs generally used the marriage to pay off debts or advance their careers. Happily, we’ve given these traditions a more romantic spin. 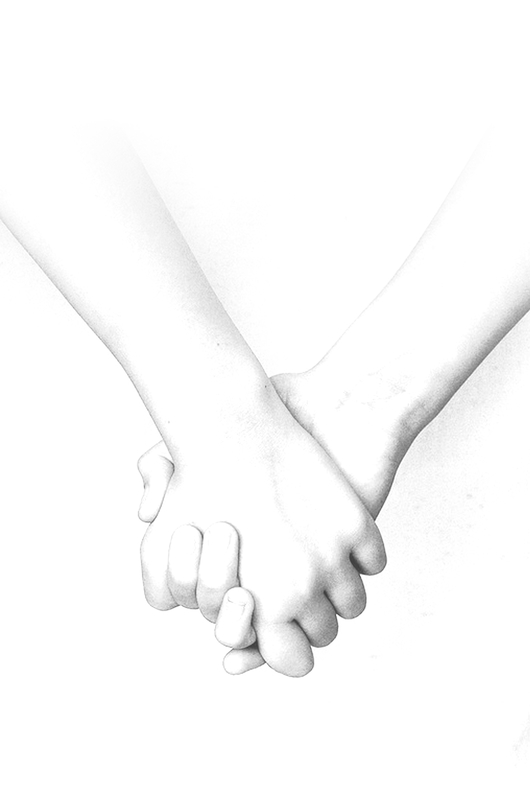 Fast-forward to 2015, and love now fuels our marriages. Celebrate that love with the perfect gift. Married couples feel a thrill when they Show off their new love. Check out our wide selection of personalized gift ideas, including notes, cards, tablets, notepads and napkins. Couples 7 Tablet Set: They can display their combined names on seven tablets of various sizes in a tasteful stainless steel holder — both beautiful and practical. 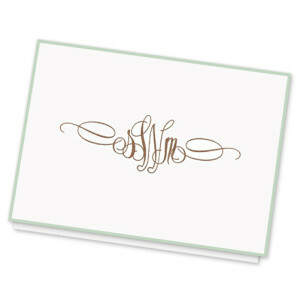 Chesapeake One Line Card: We will expertly emboss their names on an oversized card. This Chesapeake card offers plenty of room to write. 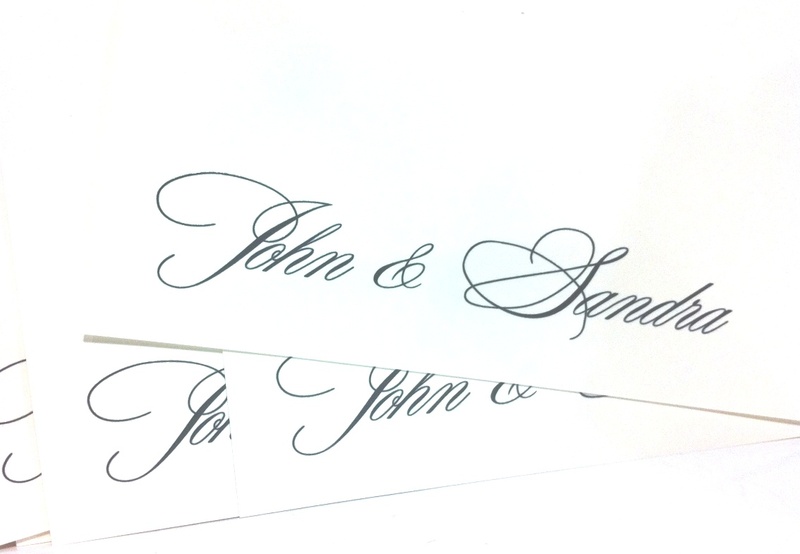 Choose the optional lined envelopes to make this gift extra special. 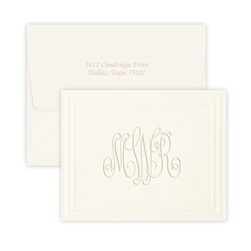 Traditional Monogram Note: They’ll enjoy writing wedding thank you notes on these classic and understated notes. Choose the optional return address if the couple has already found their forever home. 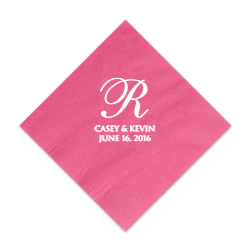 Personalized Napkins and Guest Towels: Always in style and always impressive. They’ll enjoy using these at their first “official” get-together as Mr. and Mrs. And don’t forget, summer BBQ season is also upon us. Do You Need to Send a Save-the-Date Card? 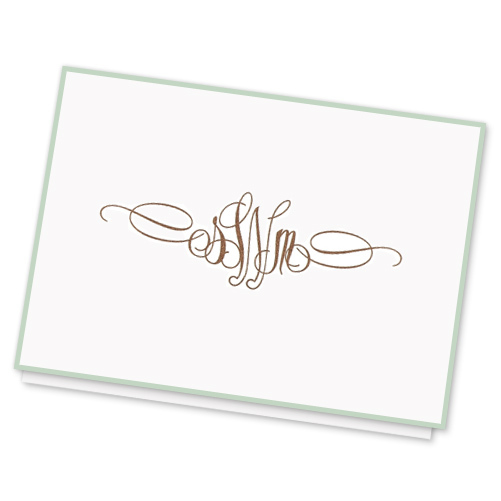 Our Early Spring Save the Date Card elegantly gives guests advance notice of your wedding. Sending a wedding save-the-date card: when is it necessary and when is it not? These days, there are so many tasks associated with planning a wedding. It’s nice to know if they are all must-dos or might-be-nice-to-dos. Wedding save-the-date cards straddle both. Sending a save-the-date card has become a necessity in certain situations. If you are planning a destination wedding, send one. Same goes for a three-day weekend extravaganza. They are also convenient for a holiday weekend wedding. Have a lot of out-of-town guests? Accommodate them by giving them advance notice. In these situations, as a general rule, send a save-the-date card at least 6 months before the ceremony. For a destination wedding, send one 8 months ahead. Giving your guests advance notice about your wedding date will give them adequate time to make travel arrangements. They may also need to rearrange work schedules and save for transportation or lodging. 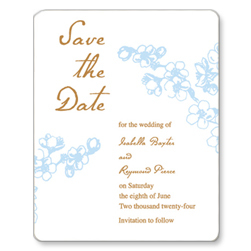 If you are planning a simple wedding locally, you won’t need a save-the-date card. A typical two or three month notice is adequate. Plus, you can count of word of mouth helping to inform guests of your wedding date. 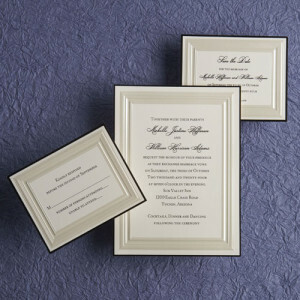 If you’re looking forward to an upcoming wedding, now is the time to start thinking about your wedding stationery. These papers will help make your day special, like the save-the-dates, the invitations, and thank you notes. You may think that you’ll only need personalized thank you notes for writing wedding thank yous after the big day, but there will be many other occasions to pen a line of appreciation. Think engagement parties, bridal showers, luncheons and get-togethers. Each time someone hosts a party, sends a gift or extends their congratulations, you should respond with a personal, handwritten thank you note. 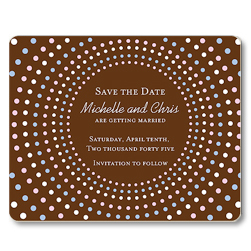 Embossed Graphics also makes beautiful wedding invitations. You can find them at your local stationery store. We craft them with triple-thick luxury paper. 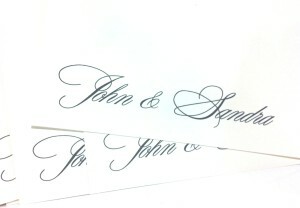 Plus, we also include special treatments like elaborate borders, pearl coatings, raised ink and cotton and linen papers. 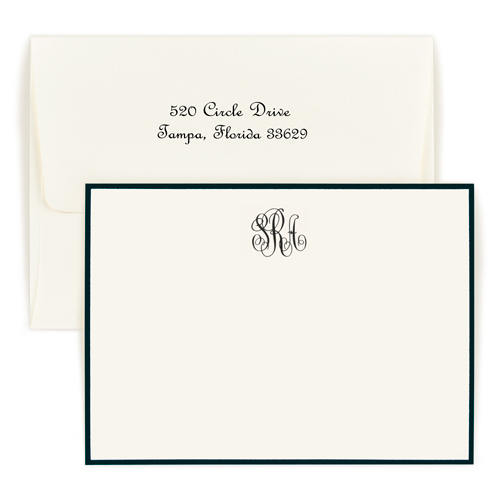 You can order envelopes with fancy, patterned, hand-inserted linings and return addresses. As with our stationery, you have a choice of white or ivory paper. In addition, we color-match the envelopes that we make right here in our American factory. We make all our wedding invitations within three or four days.